Jewelry. What form wilt thou transpire? Touched by torch's flame and clamor? 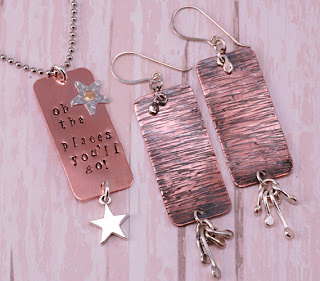 Stamped, riveted or textured so? Your shape is perfect as far as blanks go. Many possibilities delight me entire. Beaducation blank model CO072, my heart is thine. Yep. I love this blank so much that I wrote an Ode Poem honoring it. Since it is 24 gauge and measures a generous 1 3/4" (44mm) by 25/32" (20mm) it is perfect for using in statement designs. Here are three of my latest that feature this blank. This pair of earrings may be large, but they are really light. I hammered a pattern across the front using the Fretz Sharp Raising and Texturing Hammer. I made some balled headpins (following the directions in our FREE Online Video class Making Your Own Balled Headpins) and connected them to the bottom as dangle. The shape of this blank is perfect for stamping words and sayings. For the pendant above, I used the Beaducation Original Lowercase Wackadoodle font set and riveted the Small Rounded Point Star blank on the front that I stamped in a random star pattern. 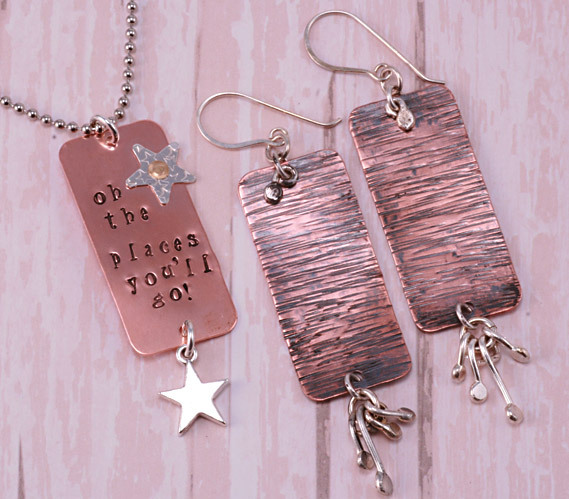 I added the Star Charm and the pendant is ready to wear and then attached earwires (learn it in our FREE Making Your Own Earwires class). I stamped and set three rivets along the center of the blank and strung it on a 45" length of dyed silk ribbon. 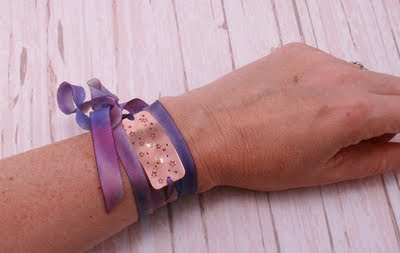 The ribbon wraps several times around the wrist and ties in a knot or bow. The blank is curved with the Nylon Jaw Bracelet Bending Pliers. I think you'll love this blank so much, you'll be writing your own Ode in no time. What wonderful and very different ideas for the same blank! I love what you did with the same blank. And your poem is so cute. I'm trying to save my money for the lowercase Kismet stamp set. I love that set. I've just got a Block letter set now and would like to add some 'pizazz' to my stamping. That and the Ballroom boogie are my favorites right now. I'm your newest follower, via RSS. KaysKreations sent me.